Located in northern Europe, Norway is a popular destination with tourists looking to experience Mother Nature at her finest. Largely unspoiled, Norway’s natural beauty is its biggest draw. Those planning a trip to Norway, and intending on arriving by air can expect to land at Oslo Airport Gardermoen, located 22 miles northeast of the Norwegian capital of Oslo. Those that prefer a land arrival will find the country linked with the European mainland via Denmark and Sweden. The city of Oslo hosts a number of tourist attractions and serves as a good starting place for any trips further afield. Visitors can enjoy the likes of Vigeland Park, which is home to an array of sculptures, as well as the Viking Ship Museum, while restaurants, bars and hotels ensure a comfy stay. Other popular urban destinations in Norway include Bryggen in Bergen, a colorful port town that is registered as an UNESCO World Heritage and features a popular funicular railway, and Trondheim, a Viking town that features the Nidaros Cathedral, the largest medieval building in all of Scandinavia. Those visiting in the summer can expect to see the crown jewels on display within the cathedral. Norway’s natural wonders however truly shine above these picturesque towns. 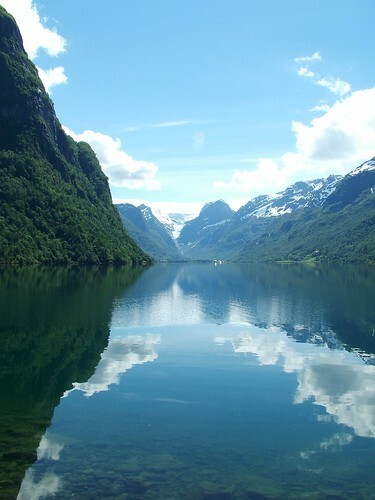 Geirangerfjord is just one of the many fjords to be found within the north and west of the country. Visitors can marvel at the waterfalls making their way into the fjord, while hiking, biking and boating are all popular pursuits in the region. The Jostedalsbreen Glacier – found in Jostedalsbreen National Park – stands 1,000 meters high, making it the largest glacier in the world. This is another must see site to add to any Norway trip plan. Further north, Tromso – which is located within the Arctic Circle – is a popular place to see the Aurora Borealis (Northern Lights) during the winter, as is the Northern Cape. The Northern Cape is considered the northernmost point of Europe and annually attracts multitudes of visitors not only looking to witness the mystical lights, but also looking to experience the midnight sun - during summer the sun doesn’t set in this part of the world. Those feeling even more adventurous may want to book an excursion to Svalbard, a Norwegian-owned archipelago located between the mainland and the North Pole. Here visitors can enjoy trekking, huskie sledding and a whole lot more.